Officers are seeking assistance after a woman is found suffering from injuries consistent with a traffic collision. Traffic officers are seeking community assistance to help solve a hit and run injury traffic collision that occurred today. 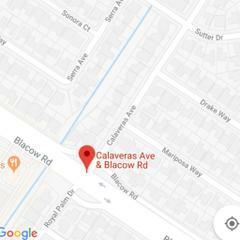 This morning while driving in the area of Calaveras Ave and Blacow Rd., a Fremont officer located an injured woman sitting on a curb. The woman was seated on the south curb of Calaveras Ave, just east of Blacow Rd. She was suffering from serious injuries which paramedics believe were caused by a vehicle. The woman has no memory of what occurred and we have no witnesses. Based on the little evidence we have, its believed the vehicle was traveling east on Calaveras Ave when it collided with the woman. The incident occurred between 7:35 a.m. and 7:42 a.m.
Traffic Investigators are seeking information from anyone who was in the area of this collision who may have seen something. Please call 510-790-6800 x3 or email Traffic Investigator M. Chinn at Mchinn@fremont.gov to report any information related to this case.